As I keep reading Frédéric Martel's In the Closet of the Vatican, I'd like to say more about the theme of corruption I featured in my last commentary about Martel's book. I noted, pointing to several important passages in Martel's book as documentation, that much of the corruption in the Catholic church right now is rooted in this historical matrix of the papacy of St. John Paul the Great. The corruption is rooted quite specifically in this matrix: while hiding homosexual secrets, the powerful Vatican courtiers surrounding John Paul chose to mount war against the queer community, combating its rights, scapegoating LGBT people — especially for the abuse crisis in the church — and targeting theologians calling for compassionate outreach to queer people. As I also added in my previous commentary about this corruption, it's the corruption of pretend heterosexuality coupled with abominable treatment of queer people — all engineered by homosexual clerics posturing as heterosexual — that's the very dark heart of the corruption within the Catholic institution. So much of the corruption — real corruption, as in Vatican financial shenanigans and policies throwing progressive priests in Latin America to murderous wolves — begins with this dark heart of the story. More needs to be said about the very specific kind of corruption, combining flagrant hypocrisy on the part of homophobic men acting out in homosexual ways with financial malfeasance with gross abuse of fellow human beings who do not belong to the entitled boys' club that is the Catholic clerical club. It's, to my way of thinking, a bit too easy to conclude, "Oh, these are men with homosexual secrets who had no choice except to cover up abuse of minors by fellow clerics, lest they themselves be outed as homosexual." The corruption Martel is describing runs much deeper than that. Here are some key passages documenting the specific kind of corruption with which we're dealing, especially in the historical matrix of John Paul's papacy — a matrix that still has enormous influence in many Catholic circles including the governing circles in the Vatican. 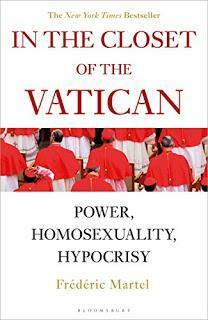 At the same time as Pope John Paul II was protecting Marcial Maciel and part of his entourage was abandoining itself to the cruising of the Swiss Guard or lust in general, the Vatican launched its great battle against homosexuals (p. 272). The picture Martel paints of John Paul's complicity in the cover up of Maciel's filthy behavior is one that will not surprise many of us who have followed that story carefully for years now — though this complicity is perhaps hidden to many Catholics and others who still bask in the warm glow of their memories of the rock-star pope who singlehandedly, as the like to believe, ended the Communist era. It's because Martel reminds readers in an unsparing way of the facts about John Paul's protection and promotion of Maciel that right-wing homophobic Catholic commentators are now coming out of the woodwork to attack Martel's book, and that John Paul's crony Cardinal Dziwisz, a main and very inadmirable character in Martel's chronicle, has just come out with fists swinging to claim that St. John Paul the Great was the grand champion of those trying to combat sexual abuse in the church. As Martel reminds us (p. 238), though invited by Benedict to "prayer and penitence," Maciel retired in great luxury in Florida, living off unlimited funds avaiable to him as the founder of the Legionaries of Christ. He died in his luxurious residence in Florida in 1988. In 2017, the Paradise Papers would reveal that Medina and Corcuera, among about twenty Legion priests whose names were published, and who were not disturbed by Benedict XVI, enjoyed secret funds thanks to offshore financial arrangements via Bermuda, Panama and the British Virgin Islands. It would also be discovered that 35 other priests belonging to the Legion of Christ were implicated in sexual abuse scandals, not only their founder (p. 238). At the Vatican the love of boys goes hand in hand with the worship of the golden calf (p. 263). According to several sources, the critical point of this network of luxury escorts [on which cardinals in the Vatican have relied] was the way in which it was financed. Not only did cardinals have recourse to male prostitution to satisfy their libido; not only were they homosexuals in private while advocating severe homophobia in public; they also took care not to pay their gigolos! In fact, they dug deep into the coffers of the Vatican to pay their intermediaries, who varied over time, as did the highly expensive, if not ruinous, escorts (up to 2,000 euros an evening for luxury escorts, according to the information gathered by the Italian police working on the case). Some Vatican monsignori, broadly informed about the affair, found an ironic nickname for these thrifty prelates: "the ATM priests" (p. 258). Of course, these prelates are now part of the opposition to Pope Francis; they harshly criticize any proposals he makes that are favourable to homosexuals, and demand ever greater chastity – even though they have practised it so little themselves. The above affair would only be a minor news story were it not for the fact that it's a template for recurrent behavior in the Roman Curia. These aren't glitches; this is a system. The corruption these men bring to the church, with their rigid opposition to any charity towards gay people, as they themselves combine sexual profligacy with financial filth, is not only about keeping secrets and covering up sexual abuse of minors to protect themselves from being outed. It's corruption rooted in their belief that anything or anyone is there for their taking as clerics. The world is their oyster. Every possible privilege is due them as ordained members of the church. Other people, non-ordained ones, are there to be used, tossed away like so much soiled tissue, when they have a hankering for such use. Because they have been ontologically elevated through the sacrament of ordination …. This is the deep heart of the abuse in the Catholic system: a clericalism which maintains that nothing is too good for priests and everything is licit for them, and laypeople are there simply to fulfill their desires.